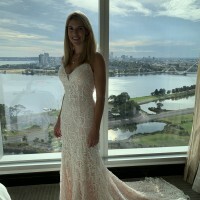 I have just worn the Made With Love Emma Dress for my wedding held at a bar in Perth last weekend. It is a white lace with a blush underlay which gives it a super pretty soft feel about it as the blush comes slightly through the lace as you can see in the photos. It is a straight size 10 with a ribbon hook added to underneath the garment so that you are able to tie the train up if you prefer the dress without it. I did this from the beginning of the day as I didn’t feel comfortable in a train as our wedding was a surprise and was quite informal. The dress was absolutely stunning and super comfortable, I didn’t feel like I was pulling the straps all night or conscious of anything. I am an 8-10 and 172cm tall and the dress fit me perfectly. A ribbon tie has been inserted underneath the garment so you are able to hook the train up.